Poles may be offended by the use of the term "Polish death camp" (Polski obóz zagłady) but the reality is, that that was the reality. The Nazis didn't want the dirty business of mass murder to be overwhelmingly in their country. Poland was a good choice both because anti-Semitism was inbred among a population of accomplices, and because it had the highest concentration of Jews in Europe. 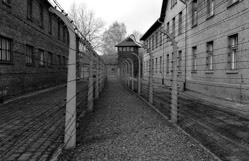 The bill that was approved by the Polish lower house of Parliament this past week (giving new meaning to the term "lower house"), and now this week by the Polish Senate, makes it a criminal offense to mention Polish complicity in crimes committed during the Holocaust. If enacted, the law would fine or jail people who blame Poland or Poles for Nazi atrocities committed on its soil during World War II, including the genocide of millions of Jews. Even foreigners would be subject to as much as three years in prison under the law. This leads me to wonder whether they would try to enforce the law overseas, or create a black list of people who have violated the law and would be rounded up upon arriving in Poland. Will the Poles arrest my daughter when she arrives on her class trip there? Pretending it wasn't the case, or sanitizing it to create an image of how they would like to be perceived, is not just fake history, it's an offense to the reality of the Holocaust in which Poles were willing partners. Maybe it offends Polish historical revisionism that they (too) were victims. Maybe their "valiant" struggle over the few weeks it took before Nazi Germany conquered Poland is somehow a source of Polish pride. Maybe it's uncomfortable and inconvenient for the Poles to admit that for centuries, Poles tolerated their Jewish neighbors, but did so with pogroms punctuating anti-Semitism with which the Jews existed daily. Maybe it's unpleasant that so many Poles willingly and even gleefully lined up to participate in the genocide of their neighbors, as they did with my relatives. And though maybe it wasn't their plan, with few notable exceptions, they followed orders and were active participants and partners in the Nazi mass murders. I'm reminded of the time, after learning that we were expecting our sixth child and only had a seven-passenger van, while looking for a larger vehicle, I happened into a Jerusalem Volkswagen dealer. They made an eight-passenger car that was reputed to be reliable and a good value. Trying to sell me the car, the salesman noted that this model was built in Poland. I commented, "Then it must be good, because we all know how well the Poles follow German orders." Either the salesman didn't get it or didn't think it was so funny. But it is true. 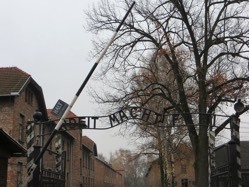 Adding insult to stupidity, the timing of the Polish vote last week took place on the eve of international Holocaust Remembrance Day, specifically designated as such on the day that Auschwitz-Birkenau, Poland's most infamous death camp, was liberated. Israel's Foreign Ministry commented, diplomatically, that the timing was "particularly surprising and miserable." Justifying the law, Poland's ruling Law and Justice Party, claimed this is part of an effort to prevent the "slandering the good name of Poland." The irony and oxymorons abound. When I mentioned once to my Polish-born grandmother of my interest to go to Poland one day, she broke down in tears, pleading for me not to go. "The ground is soaked in our blood," she cried. By "our" she didn't mean generically the Jewish people, which is true. She meant her parents, siblings, nieces and nephews, friends and neighbors who weren't as lucky to get out as she had been. In fact, so inbred was Jew-hatred that the difference between just "plain" Jew hatred and murder was like the difference in baseball of a batter connecting and following through. And with the Nazis calling the plays, the Poles excelled at their "follow-through." If my grandmother were alive, I suspect she'd go a step further than calling them Polish death camps. She'd probably refer to Polish death culture, or Poland as a death country. In fairness, Poland has come to terms with its role in the Holocaust, a little. However, they still have yet to return looted property to the survivors of those they murdered. Worrying about what terms are used to describe their complicity in the Holocaust, from death camps to the mass shooting (as in those in which my relatives were murdered in Kanczuga), is a pathetic waste of time. If the Poles are worried about slandering their "good name," denial of their role in the Holocaust is the exact wrong way to do it. The fact is that Polish death camps existed. Even if "Polish" is only used as an adjective to describe the location of the death camps, it's historically accurate. Denying that is absurd and covers up their guilt. Guilt is uncomfortable. But too bad. I'm reminded of a joke kids used to tell when I was growing up. "Why does the new Polish navy have glass-bottom boats?" one would ask. Answer: "To see the old Polish navy." In the context of this law, it's also probably to see any semblance of Polish integrity, far beneath the old Polish navy. The law still needs final approval from the country's president. Maybe smarter minds will prevail over those in the "lower house." It may not be too late to influence the outcome. If you'd like to express your thoughts on the matter to one of hundreds of Polish diplomatic offices around the world, please email me for a complete list of their emails. Jonathan Feldstein was born and educated in the U.S. and immigrated to Israel in 2004. He is married and the father of six. Throughout his life and career, he has been blessed by the calling to fellowship with Christian supporters of Israel and shares experiences of living as an Orthodox Jew in Israel. He writes a regular column for Standing With Israel at charismanews.com. He can be reached at firstpersonisrael@gmail.com.